The PE9312 is a high-performance static UltraCMOS® prescaler with a fixed divide ratio of 4. Its operating frequency range is near DC to 1500 MHz. 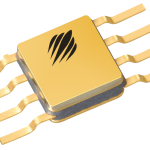 The PE9312 operates on a nominal 3V supply and draws only 6.5 mA. It is offered in a small 8-lead CFP package and as DIE and is capable of handling frequency scaling and clock generation solutions.